Voters were asked about four current issues being discussed in the news. 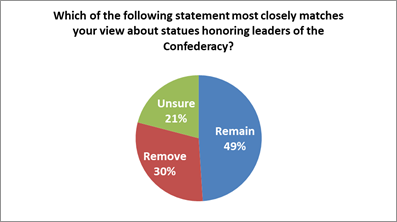 First they were asked about statues honoring leaders of the confederacy and 49% agreed with the statement that statues should remain in public places while 30% would like them removed. 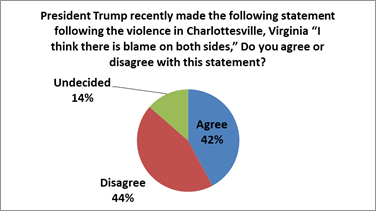 When asked about President Trump’s remarks that in Charlottesville, VA “there is blame on both sides”, voters were split with 44% disagreeing with the statement and 42% agreeing. An item that is being discussed by candidates in Florida is gun laws. 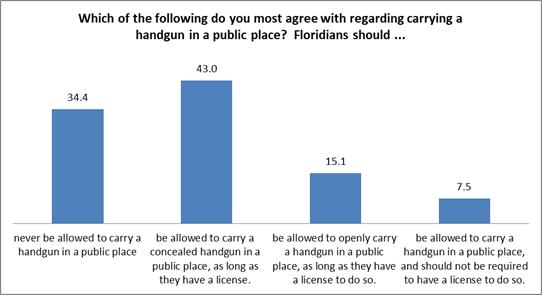 When voters were asked what limitation if any should be placed on carrying a handgun in a public place, 8% said they should always be allowed to carry in public even without a license while 34% said they should never be allowed to carry in public regardless if they had a license. Forty-three percent (43%) would approve of concealed carry with a license and 15% approve of openly carry with a license. Voters were split on what to do with Obamacare (ACA) as 30% of voters want to keep it as is while 33% want it repealed in part and 37% want it completely replaced. 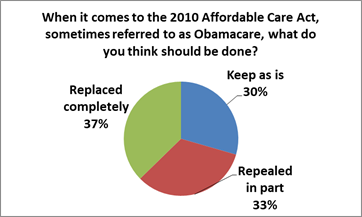 Younger voters are most in favor of the ACA with 36% wanting to keep it as is and 25% want it completely replaced. The oldest voters are most opposed with 25% wanting to keep it as is while 40% want it completely replaced. As expected Democrats were most in favor of keeping the law as is at 51%, Republicans were most in favor of completely replacing at 59% and Independents fall in the middle with 27% wanting to keep it as is and 36% want it totally replaced. Next voters were asked about potential 2018 races including a hypothetical match up for U.S. Senate and the Democratic and Republican primaries for Governor. With term limits keeping Gov. 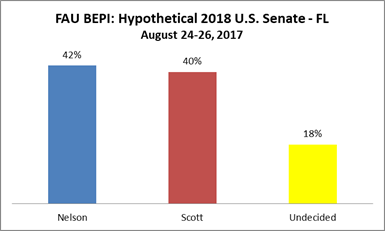 Rick Scott from seeking re-election, a hypothetical matchup with Senator Bill Nelson has Nelson ahead 42% to 40% which is well within the polls confidence interval of 4 percentage points. 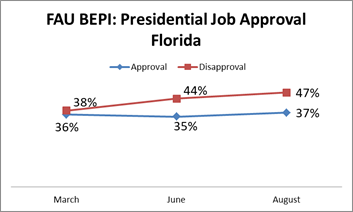 While Nelson carries an approval/disapproval of +4 (36% to 32%), both his approval and ballot test are well below the 50% threshold incumbents are looking for in their re-elect campaigns. 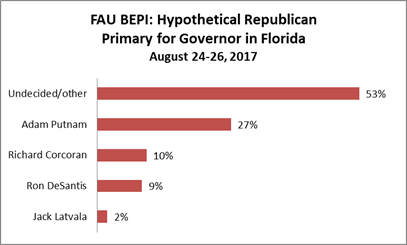 In a potential GOP primary for the above mentioned open Governor seat has FL Commissioner of Agriculture, Adam Putnam with a significant early lead at 27% with FL House Speaker Richard Corcoran at 10% and Congressman Ron DeSantis in third at 9%. Fifty-three percent (53%) of likely GOP primary voters were undecided. This subsample had a confidence interval of 6.5 percentage points. 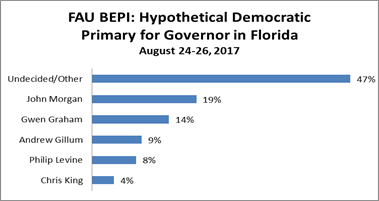 On the Democratic side things are more open with activist and attorney John Morgan leading that pack at 19%, former US Congresswoman Gwen Graham is in the hunt at 14% and Tallahassee Mayor Andrew Gillum along with Miami Beach Mayor Philip Levine is at 9% and 8% respectively with 47% undecided. This subsample also had a confidence interval of 6.5 percentage points.